I have six old typewriters, and my Underwood No. 5 dates back to 1889, shortly before I was born. I was content with my collection until a friend shared a photograph on Facebook of a teapot shaped like an old typewriter. Without any self-control or deliberation, I ordered the wonderful piece even though it was expensive and had to be shipped from England. I have no rationale to explain this compulsive, selfish purchase. But, I don’t care. The teapot arrived, safely packaged and authenticated with an official Customers Declaration and a Royal Mail stamp. It’s now sitting in a place of honor in my kitchen, and I want all my writer friends to come over for tea and scones. 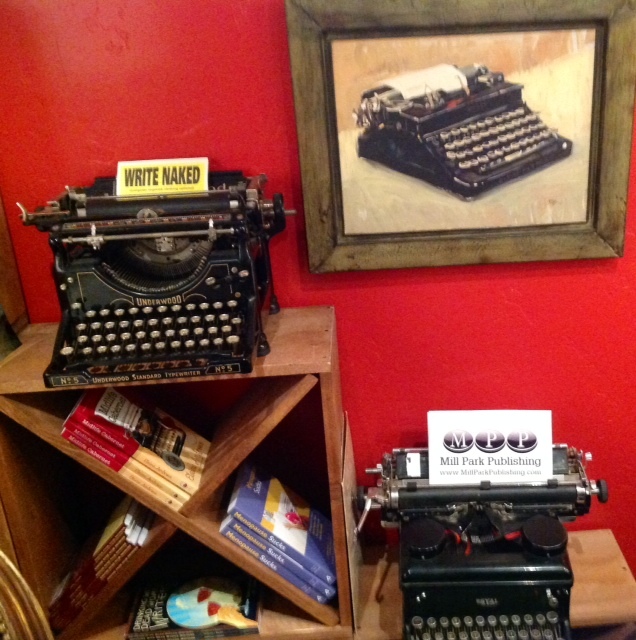 My old typewriters are in my office, along with my business logo for Mill Park Publishing. The logo was created using typewriters keys. I store my typewriters on a wine cabinet that also holds my books, making a focal point for my favorite things: wine, books, and typewriters. Just ignore the sign that says “Write Naked.” I can’t help myself. My fascination with typewriters dates back to my early childhood. To supplement the family income, my mother worked at night typing reports for local businesses. I remember being lulled to sleep with the sounds of syncopated typing and the familiar ding at the end of a line. Her typewriter now is in my collection, along with my first typewriter that I took to college. We didn’t have word processors or laptop computers back then so we made sure our papers were correct because any error had to be manually erased. I interned at a newspaper during my senior year in college and worked on a manual typewriter. I expected to write great feature stories or compelling investigative journalism. Instead, I was assigned to write obituaries. Through writing the stories of the dearly departed, I became fascinated with the lives of ordinary people. I often added amazing and exaggerated comments into the obits. No one ever complained. Subsequent jobs included writing and typing. I received my first word processing computer in 1984 when I worked in corporate communications. I missed the sound of the type (even though now there is an application for that.) I also missed the intimate connection between one machine and me; my new computer was linked throughout the company and I was nervous to type anything frivolous or nonessential. Computers can rob the spontaneous fun out of working, but I’m addicted to their ability to format, cut and paste, spellcheck, and store. But they often crash, and my old typewriters only needed new ribbons. 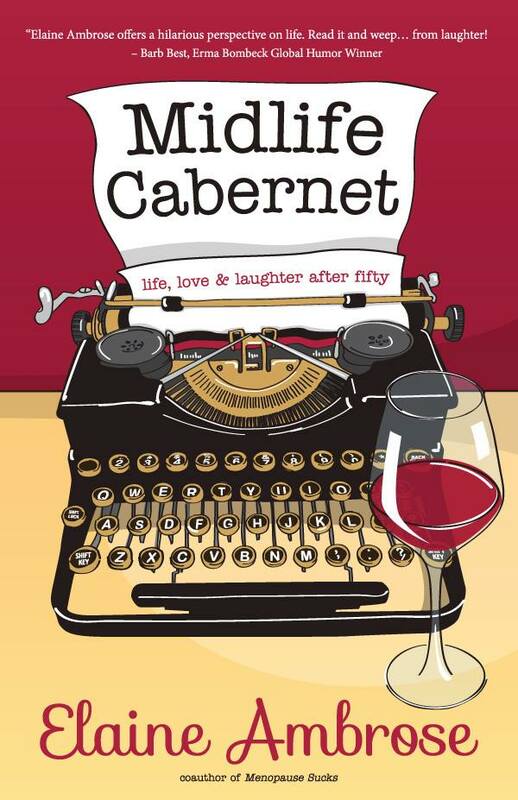 My recent book, Midlife Cabernet, includes an artist’s rendition of one of my typewriters. Of course, there is a wine glass. That’s just one more obsession. My morning ritual consists of taking coffee or tea into my office. Now I’ll pour a cup of tea from my authentic typewriter teapot from England, enter my office and nod to my vintage typewriter collection, and sit down at my desk to work on my laptop. For a compulsive type of person, that the perfect way to begin the day. Yes, Michele, I do. I hope to see you again soon. I’m obsessed with typewriters and teapots, and have a small collection of both, but not the glorious typewriter teapot from England! I love it. I love this blog, and I adore tea and scones. Ruth, I adore you. Tea sometime soon? When things settle down for you, Elaine, we’ll do something. Tea or wine or meet for breakfast or lunch, whatever, but no rush. The season will escalate quickly from here, and it may be into the new year before we manage it. Right now, take good care of yourself, do some healing inside and out, and we’ll talk later. Great story. I love the idea of typewriters but am so very thankful we have our new technology (and spellcheck.). I love typewriters, too, but boy did we have to press down hard to get a hit! 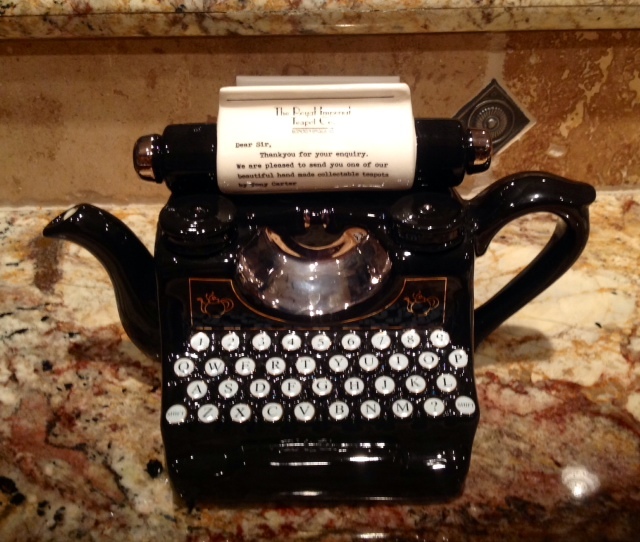 I love typewriters and teapots. Taking typing in high school was one of my favorite classes. I miss the sound and the way the keys click under my fingers. Thanks for the post! I don’t wear a lot of jewelry, but one of my favorite pieces is my letter ‘M’ necklace…it’s an old typewriter key. I adore it.